RedInkRadio: Darwin Carmichael is Going to Hell: The Book: The Kickstarter! 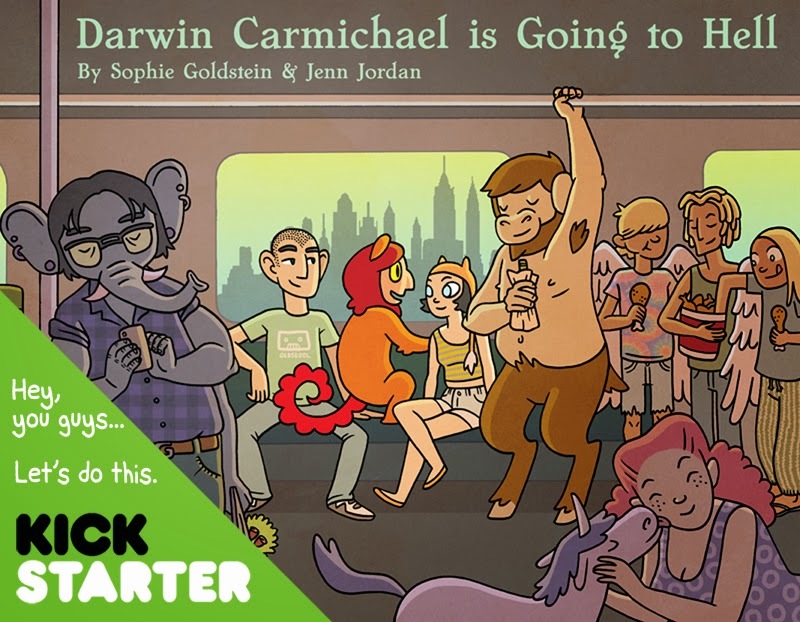 Darwin Carmichael is Going to Hell: The Book: The Kickstarter! Darwin Carmichael is Going to Hell (dcisgoingtohell.com) is set in a world where mythical beings not only roam the earth, but also camp out on your sofa and raid your refrigerator. In 21st-century Brooklyn, karma can be tracked like a credit score, and our protagonist Darwin Carmichael has a big problem. Due to an unfortunate incident involving some intense snogging, an unbalanced high chair, and a framed image of the Buddha, he acquired a massive karmic deficit. Long story short, he’s going to go to hell...and he should probably do something about that. My writing partner, Jenn Jordan, and I began publishing our comic in January 2009, and we just finished it this past summer. The print edition of the comic will include the complete, 360-strip saga of Darwin Carmichael is Going to Hell in beautiful, full color, and will feature behind-the-scenes commentary as well as concept art and a few other goodies. Our goal is to raise $12,000 to fund our print run by December 11th. Please consider contributing!